1. "each generation currently alive is more authoritarian than older generations—with young Millenials the least democratic of all"
2. "Trumpism (and Bernie Sanders-ism) are but the [parochial] American symptoms of a global phenomenon: the astonishing rise of illiberal movements of the far right and far left." Much of this, of course, conforms quite neatly to a liberal narrative that's gained prominence in the past year. On one hand, we have so-called horseshoe theory: the notion that the right and left are just two sides of the same authoritarian coin, while centrist liberalism is the only truly democratic ideology. On the other hand, we're told that it is the wizened pragmatic olds who have best grasped this essential truth, while young people are naively susceptible to the temptations of radical authoritarian idealism. 1. 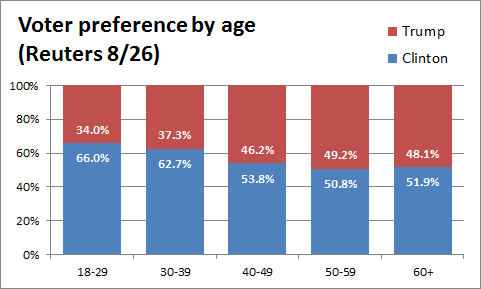 The Hitler Youth theory is essentially wrong - voter preference trends prove that it is the old, not the young, who tend to prefer the authoritarians. This is why they prefer Trump to Clinton, and it is also why they preferred Clinton to Sanders. 2. Horseshoe theory is essentially wrong - it's just garbage rhetoric from centrists who try to lump in all of their opponents together with Jonah Goldberg "Liberal Fascism!" style left-punching. That's why the same people prefer Bernie Sanders and Hillary Clinton to Donald Trump instead of preferring Bernie Sanders and Donald Trump to Hillary Clinton. In the spirit of moderate centrism, I'd like to suggest that there's truth to both of these perspectives.